Ali was introduced by bod in 2000. No guesses needed for Ali's nicknames apart from perhaps the references to Kaa Ching! Ali takes a lot of stick from the lads for his alleged eating habits, mostly when referring to Little Chef's en-route to events, perhaps even the odd Burger King, Pound Hill Kebab shop, the list can go on! He maintains that this is all a fallacy and claims NOT to have visited a little chef for some years now (we believe you Al). 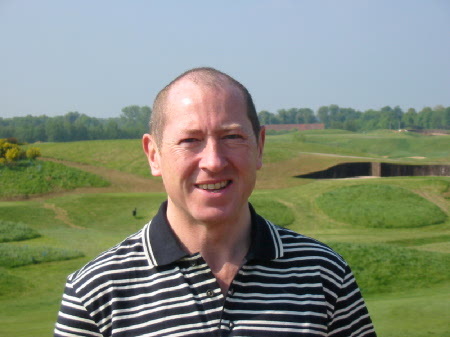 Somewhat unusual for a married man, Ali is also a regular Sunday golfer and is a founder member of the now infamous Bandit Squad, a group of members dedicated to scouting out courses before the monthly and Yearly outings. Ali now is the proud owner of proper clubs in the for of his mighty Wilson Deep Reds. He is often found wagering bets with his chum Corky. Bodder Driving off the 1st at Barnham Broom 2003 wearing his 'Top Dog' waistcoat. What a time to film you! 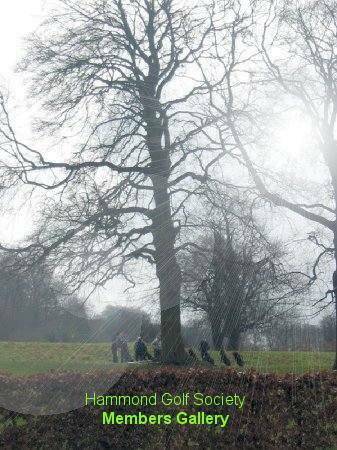 In 1999 at Meon Valley the society found themselves in a tricky situation. We had expected 16 participants but ended up a man short. With only 15 participants, the Ryder Cup was in danger of becoming postponed. However, one quick phone call and Bodder was on his way that evening. The Ryder Cup was saved and Bod has been a regular ever since. Bod was the Top Dog winner in 2002. Bod also won the 'Bloody Nice Jug' trophy in 2002. In 2003 though, the Top Dog and the BNJ was handed over to Richard Collins and Pete 'The Meat'. Comical Farts are often the mainstay at the events throughout the year! As the elder statesman of the society Stumpy is the Grandad of the society and has affectionately been dubbed the first member to qualify for the HGS Seniors Tour. Cookie is famed for his attack of cramp during an evening meal at St. Mellion in 2001, which prompted the introduction of the 'Limp and Lame' Trophy. This takes the form of an "In an emergency break glass' unit with a tube of cramp cream inside! Cookies golf is consistent, he has the "old man" swing, a half back swing so as not to interfere with the replacement hip and a follow through with a groan and a few clicks of the old bones! Corky was introduced to the Society by Bod at St Mellion in 2001. He claims to have only been playing the great game since 1999, Corky at 25, is the baby of the society. Formally known as 'The 5 Iron'. 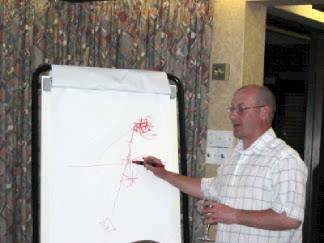 Never short of a few words on the forum or email corky is the self-confessed 'King of Banter', for the pure quantity, there is no question about it. Corky had a good showing on his debut, corky managed to finish 19th in 2002 (or joint last depending on how you look at it), we think he should improve over time as the number of clubs in the bag increases! His showing in 2004 was quite the reverse, finishing stone last! Bless! Corky accepts his Stray Dog Trophy in 2003. The main reason the society exists is due to this man. 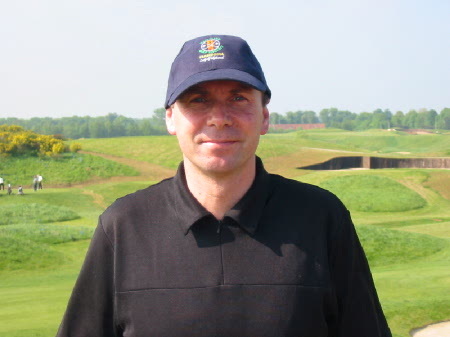 In 1995 Gary invited five of his friends to join him at The Belfry for a weekend's golf and here we are many years later, 24 strong, and the Hammond Golf Society is well and truly established. 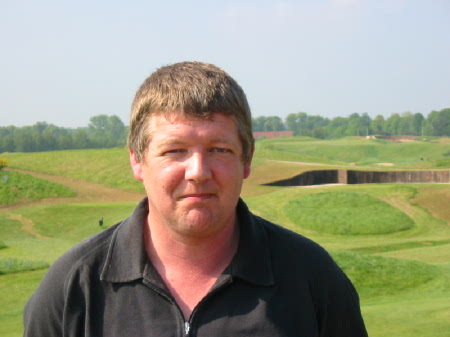 Gary won the Top Dog Trophy at St. Mellion in 2001 and the Ryder Cup putt-off that year. Gary finished 17th in 2002. He is also well known for the worst drive in the society, as his porsche span off the road in wet weather during a rushed attempt to make the tee-off time at one of our monthly events. Happily Gary is in fine shape, unfortunately the same could not be said for his car after the crash. Now he has an additional 'Spin Doctor' nickname. Howie's first HGS tournament appearance was in 1999 at Meon Valley in 1999, and still to this day, no-one knows who invited him! Perhaps Howie just turned up for breakfast at the wrong venue? Anyway, there he was, and many years later we're now paying tribute to the most improved player in 2002. Tony is another joker in the pack and provides copious amounts of laughter both on and off the course, especially as the amount of drink consumed goes up during each evening. Howie giving his Golf-Ruling Presentation at Barnham Broom, he had us all in stitches ! 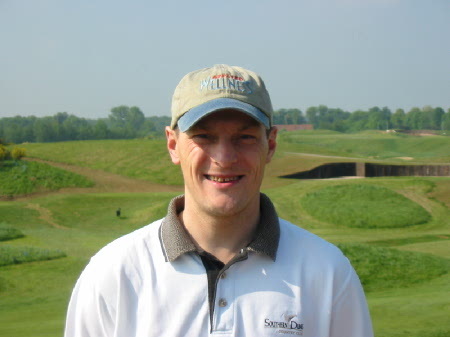 Kevin first joined us at St. Pierre in 2000 and his rookie year saw him finish second in the stableford event. As Captain America that year, he managed to win a tense putt-off to give the USA their only victory in the Ryder Cup event in six attempts to that date. 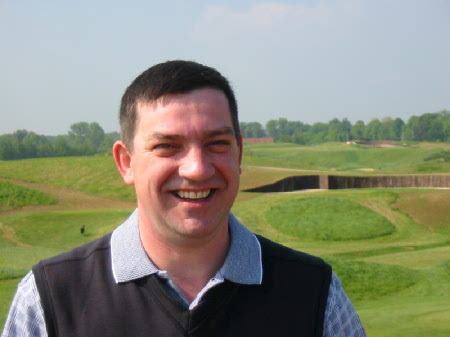 Kev also won a society match play event in 2002 and in the process won a ticket to see the REAL Ryder Cup at the Belfry in September that year. 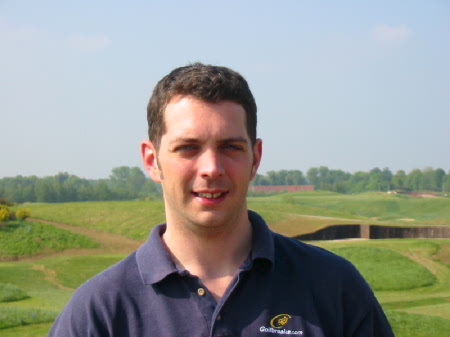 Martin was introduced to the society by Tel in 2000 at St. Pierre, having worked with Terry 2 years previously. Martin is responsible for the design and the updating of the HGS website and is doing a superb job in the process, not bad for a 'ginga'. He is the only person in the society to inflict a match-play defeat on Bodder during the last four years. 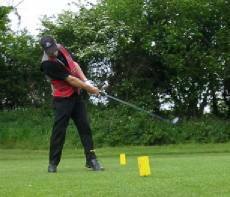 He at last played fairly well in the 2004 yearly event in France reaching 10th place overall using his new clubs. 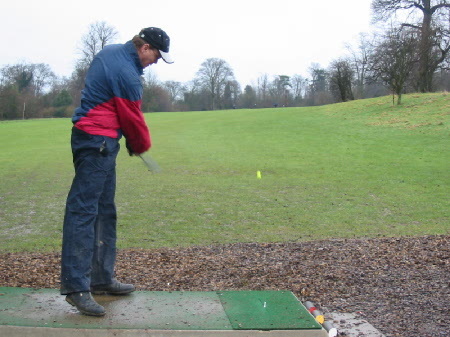 He promises to be in contention again for the 2005 event as he practices with his new and HUGE 'Big Red' Driver and new irons. Martin is one of the longer hitters from the tee, but they aren't always the straightest! No Pictures!! Will Have to give someone else the camera eh !! 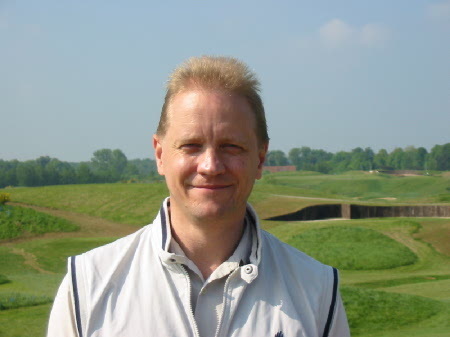 Michael is another one of the founder members and a precious winner of the 'Top Dog' Trophy at Meon Valley in 1999. During recent years though, Micky's game had suffered whilst trying to become a business entrepreneur. Micky, along with brother Richard have the honour of having the society carry their name. Exactly what they did to deserve this is not known! Maybe it's purely that they just had the majority vote! 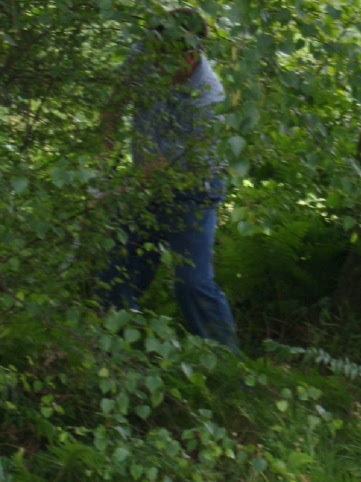 Micky reached the dizzy heights of winning the 2004 event in France though so it appears he has found the form of old. No Film Yet, Sorry Paul! Clarky joined us early in 2002, having been invited along by Corky. He was delighted to be asked to fill the space left by Frankie, as the only rookie in Cork in 2002, he immediately assumed the tag of 'The Rookie', but this was only kept for so long. So, imagine the delight when checking into the Westfield Park Hotel for last years Ryder Cup rematch when members heard "Mr Clark, Mr Clark, Is there a Mr Clark? ", "IT'S NOT CLARK, ITS CLACK!! ", he snapped, and the receptionist was suitably scorned. Fortunately, there were other members present and the name stuck. 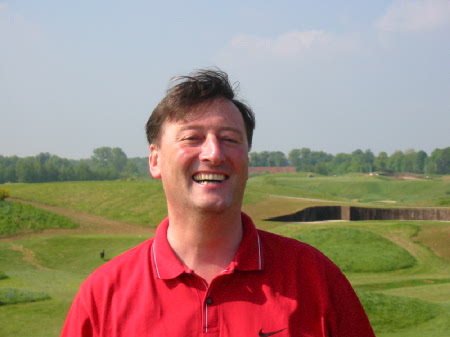 In the 'Richard Hammond' mould, Clarky is another incredibly boring golfer. He may not hit the ball a long way, but he hits the fairway and greens with unerring accuracy, and is one of the society's most consistent golfers. Nice Chip! Meat, who is also known as Bungee to some of the ladies, was introduced by Tel as a slim and shy 30-something in 1998. 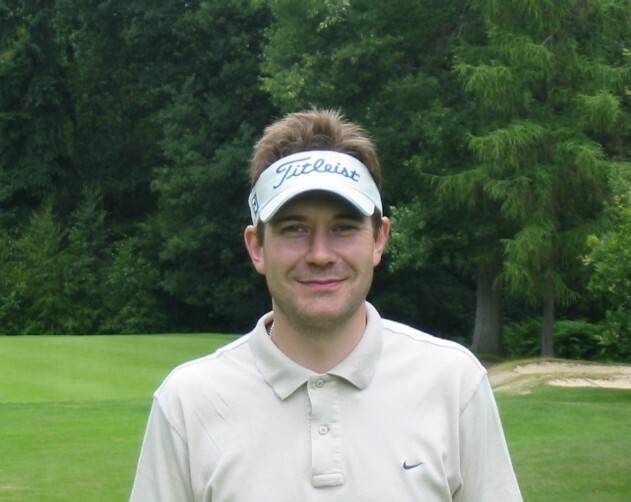 He has twice picked up the society's 'Top Dog' Trophy in his rookie year at Beadlow Manor in 1998 and at St. Pierre in 2000. His successes combined with a fluke 79 to beat a 10 handicapped Kiwi at Wokefield Park in the 2002 Ryder Cup rematch, have turned him into the confident and cocky Meat we know today. It is this confidence that has seen him become the society's lowest handicapper in 2003. Meat is renowned for being a card shark during evening events. He is also well known for turning up for an early tee time, still half pissed after having had about 2 hours sleep the night before (so he would have you believe anyway!) Members also know Pete is the sloooowest players in the society, especially on the putting surface! 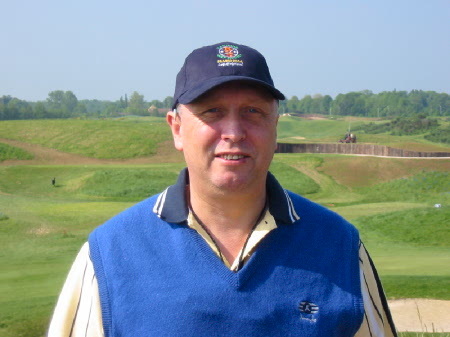 Another of the founder members of the society from the Belfry in 1995 and affectionately known at 'The Golden One'. Why you ask? Well, the answer is simple in that he drives the ball straight, and his approach shots are usually on target and his chipping and putting are largely faultless. As a matter of fact he is one of the most boring, consistent golfers in the society has ever seen (with the exception of ex-member Giles). 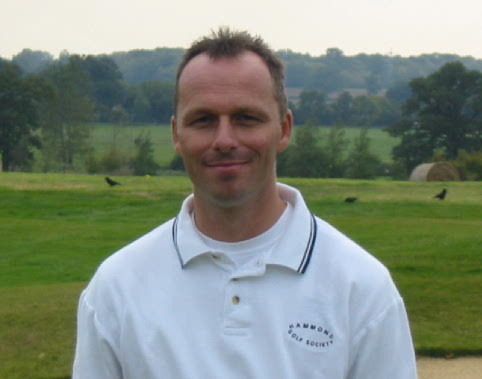 Richard was also the first ever winner of the Stableford Trophy in 1997 at Dawlish Warren. Yes, he was boring back then as well. He has consistently been the societies lowest handicapper until 'The Meat' took that honour in 2003. One of the original Six from the Belfry, Tel is largely responsible for the growth of the society since it's formation in 1995, and has recently taken on the role of HGS Chairman. 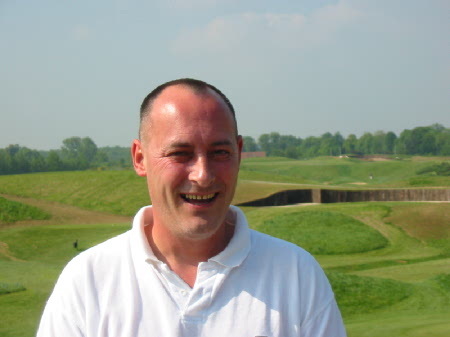 The first of Three 'lefties', his game momentarily peaked at St. Mellion in 2001, where he surprised everyone by finishing as runner up, by the narrowest of margins, to our President Gary. Tel is responsible for the inception of the 'Can't Handle The Pressure' trophy after 3-putting from just 3 feet following a superb 160 yard second to the par 4 17th at Meon Valley in 1999. Listen for the sounds of wood & water! So Funny! 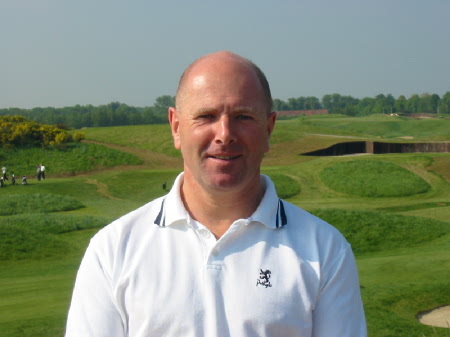 Andy has been on the tour since the very beginning as on of the six founder members of the Hammond Golf Society. More recently Andy has entertained us by turning up at society outings, by dressing up as his pop music heroes Benny From Abba and Billy Idol. All we can say is that we wish you luck during your mid-life crisis and look forward to seeing his Boy George outfit. 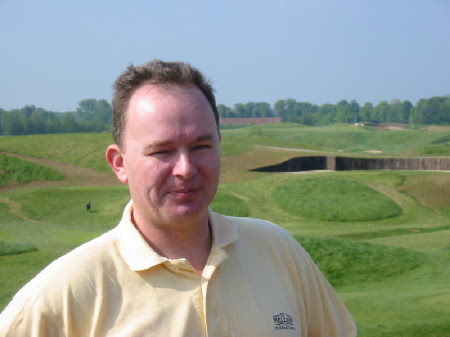 In addition, we have Billy to thank for The Stray dog Trophy which was introduced in 2003 in Norfolk, the idea being that the 13-24th position players can fight it out for winning the bottom half of the Stableford Competition during the second round. 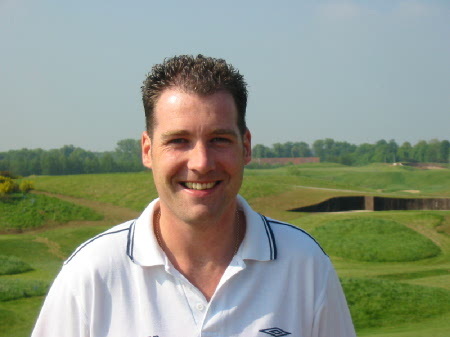 Andy reached 2nd place at France 2004, so I bet he really looking forward to his cut in 2005 event!! 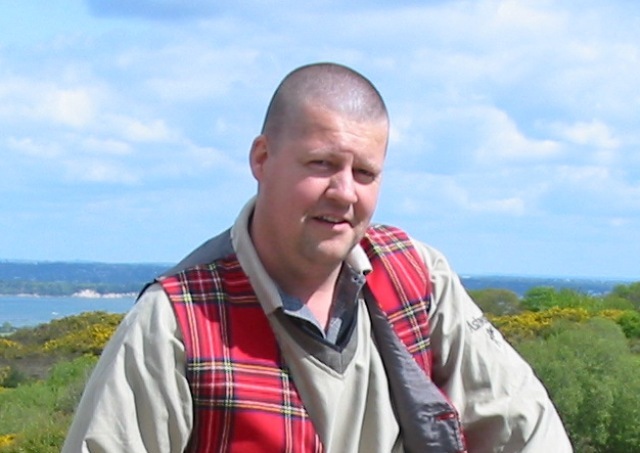 Stuart first joined the society in 2000 after being invited along by Pete. 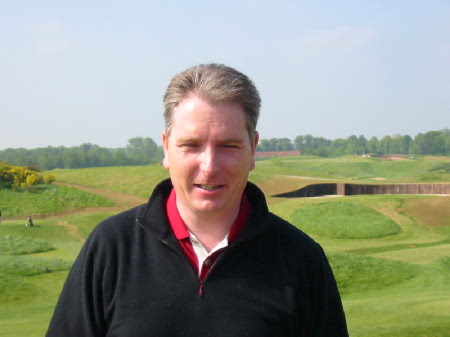 During his first few society outings, Stuart was classed as a quiet chap who just wanted to get on and play golf. However, that soon changed when he finally came out of the closet and admitted that he was a West Ham Supporter. Realising that the rest of the society found this amusing and not frowned upon (well, apart from Terry who shared his enthusiasm for the newly relegated Nationwide League Team), Stuart then felt accepted and now wears his Rupert Bear golf trousers and bright Blue PVC Wet Suit and strange headgear at events on a regular basis without fear. Some members notice a likeness between Stuart and Jamie Oliver. Likeness! Rubbish, they're Twins! Another of the founder members of the society and one of the President's best buddies. 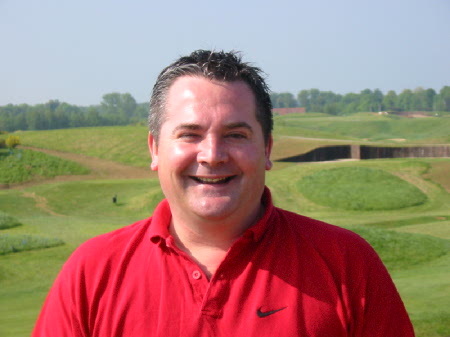 Rob enjoyed himself so much at the Belfry in 1995 that he decided to the West Hove golf club in Brighton. At a cost of approximately £600 per year, Rob enjoys nothing more than going out and having a thrash around his local course. 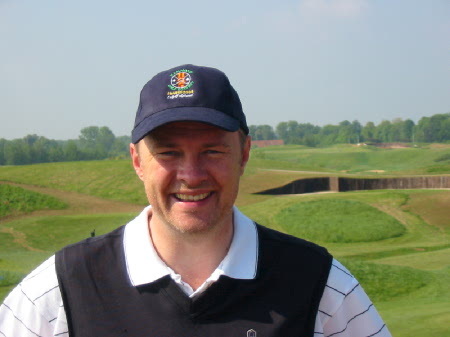 As a matter of fact, he enjoyed it so much in 2002 that he played in twice (that's right £300 per round!). 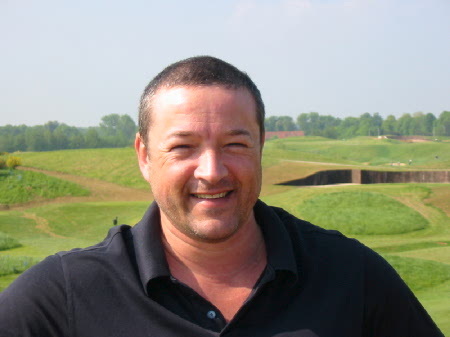 It has been rumoured that Rob if very keen to buy the golf course outright, in order to save himself some money on green fees. 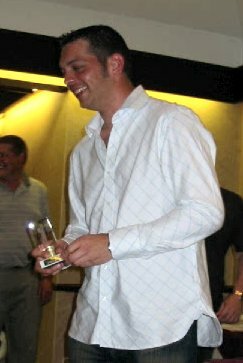 Rob held the Worst Drive Trophy in 2002. "Used to be good" is his nickname and when you play with him you can see why - due to his lack of practice, you wonder sometimes where his handicap has come from and how he paid for it! Andies 3 wood on Par 3 Andy was introduced to the society by Terry in 1998 at Beadlow Manor. He spent a lot of his early years with the society playing off a handicap of 28, but has at last shown some signs of improvement, knocking a few shots off his handicap. His enthusiasm and professionalism for the game of stick and ball are quite apparent on society outing days. 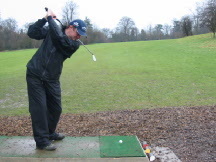 Andy will often turn up with just minutes to spare before the arranged tee time, obviously having spent a couple of hours on the driving range fine tuning his game. ..and where it ended up! 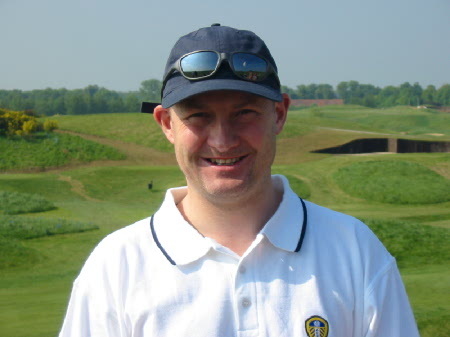 Vince joined us in 2003 after being introduced to the society by Pete 'The Meat' Billington. Because of this fact, and this fact alone, members are wary if Vince joins in for card sessions in the evening at future Yearly events. Pete will encourage Vince to distract the punters with a few one-liners, while pete scoops the pot (Pound Blind!!) 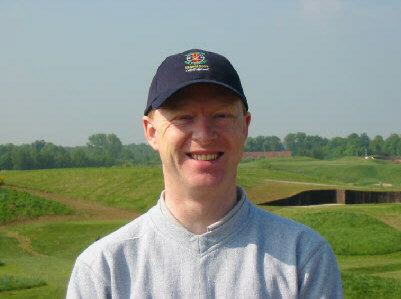 Vince had the highest handicap in the society in 2003.